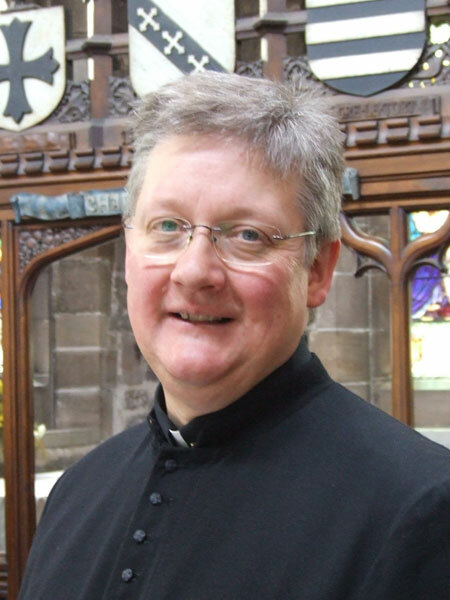 Andrew Holliday, Rector of Standish St Wilfrid’s since 2011, was made a Canon of Blackburn Cathedral in September 2012. He was formally Vicar of St Peter’s Darwen. Born in 1962, Andrew was selected for Ordination and went to St Stephen’s House in 1989, following a nine year career in catering. In 1992 he was ordained into the Blackburn Diocese, and served curacies in Blackpool and Poulton-le-Fylde. His first Incumbency was at St James’ Leyland from 1997 to 2004, and he was Area Dean from 2002 to 2004. In 2004 Andrew was appointed to the Team Ministry of St Peter’s Darwen with St Paul’s Hoddlesden. In 1997 Andrew married Vanessa, who is a Civil Servant. Vanessa played cricket for Lancashire, then coached women’s cricket, and now scores locally and nationally. Andrew’s interests are, when time allows, cooking, history – especially biographies, visiting the Lake District, and sharing in the glories of the beautiful building that Andrew along with all at St Wilfrid’s have a share in caring for. The first known Rector was Alexander de Standish, 1206; though there may have been Rectors before that date. In total there have been only forty-two Rectors in almost eight hundred years (and just nine of those were in the 225 years from 1779).